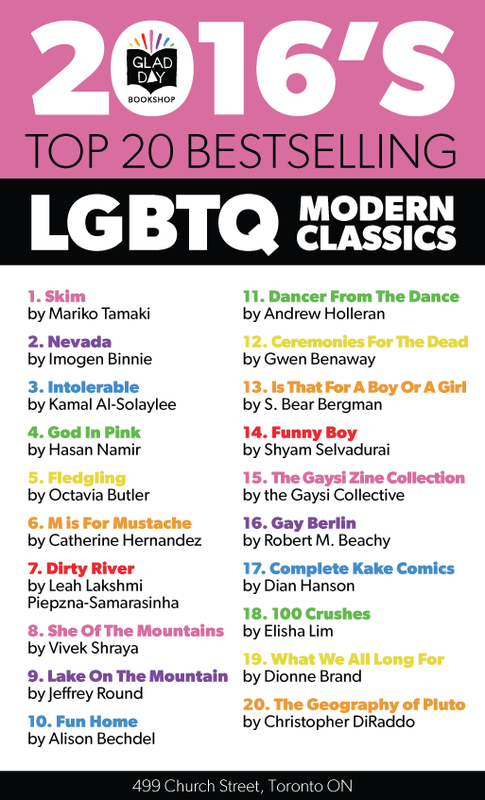 This week I learned that Pluto made the Top 20 “Modern Classics” list for 2016 at Toronto’s Glad Day Bookshop. It just slipped in at number 20, and I don’t know what that means in terms of copies sold, but I’m thrilled. Not bad for a book that was released almost three years ago. This, of course, is all due to the hard work of the people at Glad Day. Most queer writers wouldn’t be selling enough copies to make any list if it weren’t for them. They provide a prominent place on their shelves for our books, and they talk them up to their customers. You don’t have to know what you’re looking for when you walk in. Like all great booksellers, they’ll recommend something they think you might like. This makes me nostalgic for L’Androgyne, Montreal’s LGBT bookstore that closed in 2002. I learned so much about books and life here. It’s where I first got involved in my community, where I made life-long friends. I also learned what I liked to read. France, David and Johanne were always happy to share their recommendations, and it was through them that I discovered some of my favourite books: How Long Has This Been Going On, Rat Bohemia, Fingersmith, My Blue Heaven, Mysterious Skin. At last month’s Violet Hour I took a page from the past and invited everyone to wear name tags with the name of one of their favourite books on them. I also asked each reader to recommend a book before they read. The hope was to get people talking and sharing (and maybe even flirting) afterwards. To me there is nothing sexier than talking about your favourite books with another guy. I now realize that I started the Violet Hour to create a space similar to the one lost when L’Androgyne closed. Today, there is a dearth of places in Montreal where queers can come to connect. I never run into anyone anymore, except online. Here’s hoping that – for at least an hour every two months – we can create space for meaningful social interaction. I hope those in Toronto realize how lucky they are to have Glad Day. The oldest surviving LGBT bookstore in North America is going through a renaissance right now. It recently moved from its old address on Yonge to a storefront on Church. I visited it last fall during the Naked Heart Festival. The place now has a bar and a kitchen and it hosts readings, dance parties and screenings. It’s another gathering point (along with the 519 and Buddies in Bad Times) that makes Toronto a true leader in queer cultural programming. If you haven’t checked out the new Glad Day, do so.